George Kessler, NASA HUNCH Project Manager of the Johnson Space Center, tries out the iris lid designed by Laurel High School students. He said engineers at the JSC are excited about the design and are looking at other possible applications. 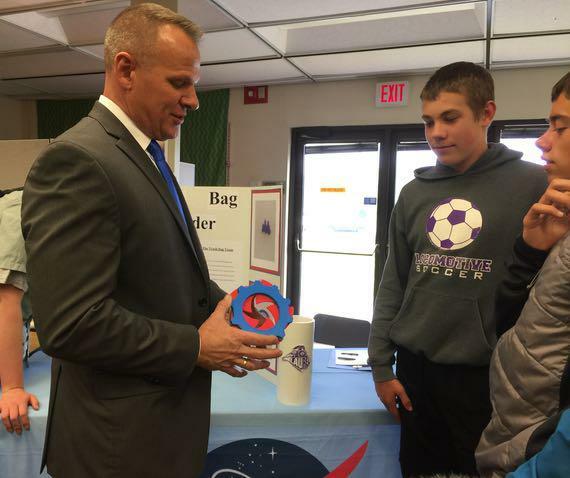 High school students in Billings and Laurel are solving problems for astronauts. NASA presented these students with this challenge: design a better way to deal with trash in space. 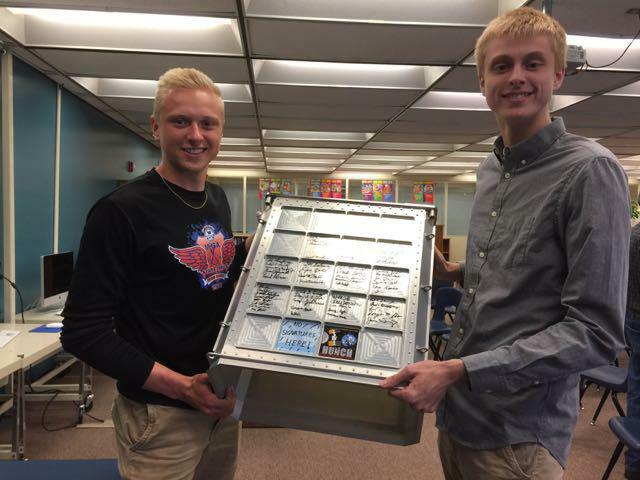 Two sophomores at Laurel High School came up with an iris lid design, programmed it into a 3-D printer and manufactured the lid as one piece. “We believe we’ll be able to use this in other places so we’ll be tapping into your expertise here,” said NASA engineer George Kessler as he spun the lid open and closed with one hand, commenting on how smoothly the lid opens and closes. A prototype of the design has already been looked at by other engineers at the Johnson Space Center, where Kessler works. He is the lead liaison for what’s known as HUNCH. The program connects high school classrooms to NASA engineers to solve problems for astronauts. “It was definitely an immediate yes,” agreed Jake Davis, another Career Center senior. Both are in the aerospace engineering class which also designed their NASA projects. Astronaut Loren Acton was the special guest speaker at the HUNCH 2017 award ceremony. He signed autographs and posed for pictures with the students. Students from both the Career Center and Laurel High School displayed their projects during the HUNCH 2017 Award Ceremony May 17, 2017 at the Career Center Library. The special guest was NASA astronaut Loren Action of Bozeman. Tyler Gurchiek, L, and Jake Davis, R, hold up the storage locker they signed with their classmates from the Billings Career Center. This locker will eventually be flown to the International Space Station to hold a science experiment. The aerospace engineering class provided quality assurance documentation for the metals/CNC machining class that fabricated parts for the locker. 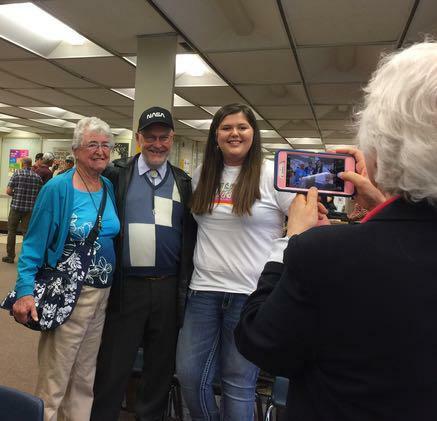 Both Davis and Gurchiek want to be engineers. Gurchiek said what appealed to him about the HUNCH program was they were given a problem to solve. “Taking that knowledge with me into college and past that I now have a real world application of starting from scratch,” he said. The Career Students worked in integrated teams, just like NASA employees. The aerospace engineering students provided the quality control documentation for classmates in the metal fabrication program who machined the latches to close a storage locker that will eventually be flown to the International Space Station. Davis and Gurchiek said metal fabrication is as much of a STEM career as aerospace engineering. “And so while that might not be the focus of all of the like pushing for jobs at the moment, there’s going to be people that the need to make the stuff that engineers design,” said Davis. 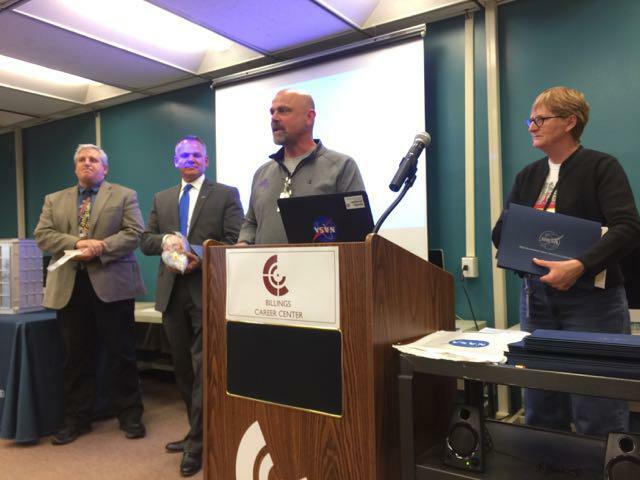 Career Center Principal Scott Anderson, HUNCH Project Manager George Kessler, Laurel High School Principal Ed Norman, and Laurel High School math teacher and HUNCH advisor Linda Wright (left to right) prepare to hand out certificates to Billings and Laurel students in the 2017 HUNCH program. That’s the message Career Center Principal Scott Anderson tells parents who are worried their student is missing out a STEM career if they want to become a welder or automotive technician. “I get that question and I try not to smile,” he said. It’s a serious question for parents so Anderson tells them jobs in the trades and industry require employees to use apply their math and literacy skills. “These students probably have to do more technical writing and technical reading than anyone else and it’s at a higher level than most other things,” Anderson said. He added automotive mechanics apply physics and metal fabrication is all about reading technical blueprints and the application of math. The school's culinary program was also involved as NASA wanted schools to submit dessert recipes that could be served to the astronauts. The Career Center joined the HUNCH program in 2015. Currently about 2,300 students in 29 states are in the program. The welding class at Helena Capital High School will join HUNCH next year. The school newsletter said industry is dealing with a severe shortage of workers equipped for advanced manufacturing and that’s why Capital High is partnering with NASA and private industry to develop that pipeline of talent. About a half-dozen Montana high school students are preparing to fabricate a part that will eventually end up flying on the International Space Station. 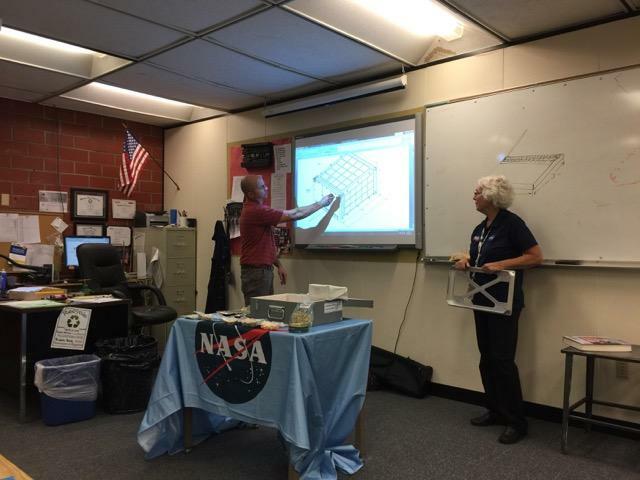 The students at Billings Career Center are part of a partnership called “High Schools United with NASA to Create Hardware” or HUNCH. The students create hardware, software, and other goods for astronauts. 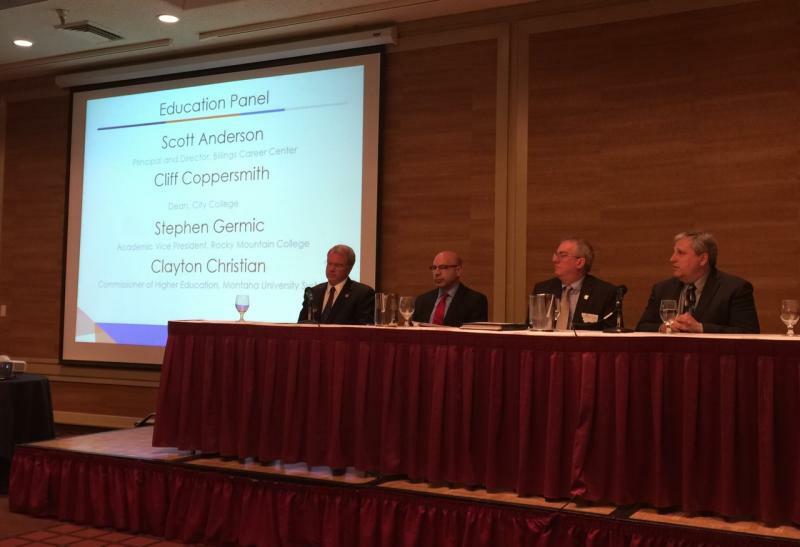 Many Yellowstone County Employers say they “don’t know” when asked to rate how well education and training providers in Billings are helping them meet their workforce needs. The finding was from a BillingsWorks survey conducted for the Big Sky Economic Development Authority. Respondents were asked to rate the numerous programs in Billings. This includes the high schools to adult education to higher education.